Doughnuts, degradation, disgust and delight. The words to come out of the Indian GP were both funny to hear and saddening. The doughnuts were great to see as Sebastian Vettel put on a spectacle for the crowd as he claimed the title. Finally, he received the cheers he deserved, after a WDC that has seen his worst finish (excluding the Silverstone retirement) in 4th place. The degradation on the soft tyre was disappointing as it gave the race a very much 2010 feel as soon as they ditched them. The bulletproof medium tyre seemed to go on forever rendering strategy almost null and void. The disgust heard over the team radios of Kimi Raikkonen and Sebastian Vettel for different reasons. Can either team really be surprised that their headstrong World Champions did not listen to them? And finally, delight as all around the paddock the kind words about India could be heard being echoed from all and sundry. The next week will be crucial to whether the GP returns to the Buddh international circuit, with the perception of the race being positive it is now over to the Jaypee group to build on this. No surprises for pole and victory; but who stood out this week in the league? 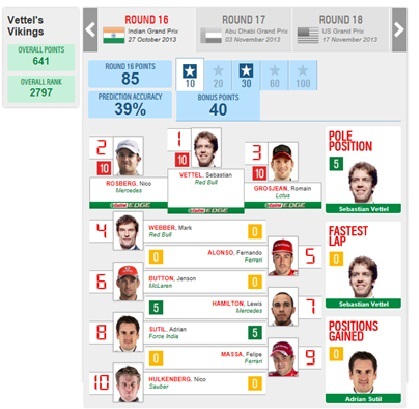 Here at TJ13 we are not usually ones to blow our own trumpet, however, in a week where many others failed to improve on their place, it was my team Vettel’s Vikings who improved the most to move into 15th position. A somewhat fortunate guess on the podium helped this cause. Merkiddies F1 had a poor weekend at the team’s home GP dropping 4 places. The predictable Vettel pole and win were the only things that really fell into place for the team, as Webber, Raikkonen and Hulkenberg all let the side down. This weekend saw KimiKaze XI move up 1 place, and consequently out of the best of the rest page of the league table. 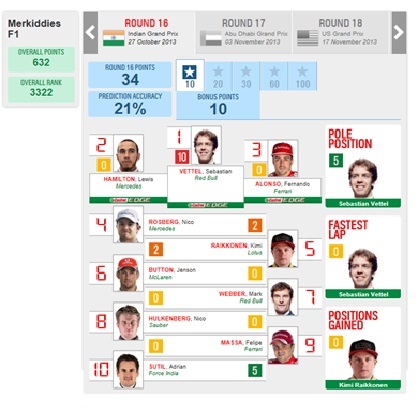 Even having predicted the unthinkable (Vettel not winning), the team still scored 39% accuracy with a bold choice of Paul Di Resta in 8th and Adrian Sutil in 9th. A somewhat successful home GP for the team. It seems the bad luck will only continue for Mark Webber as he goes in search of a final GP victory before bowing out on his F1 career. Stuck on 9 wins, his chances of making it to double digits seem to be becoming less and less. A double points finish for the Force India cars will have been a welcome relief for the Silverstone team as well as being something that few had predicted. Sauber’s chances of progressing up the WCC table diminished with Hulkenberg’s retirement. With the front positions being all but decided before the race, it could be the midfield battle which will be the difference over the next 3 races to decide who is crowned 2013 TJ13 Fantasy F1 Champion. Can Force India regain some of their form from earlier in the season or will Hulkenberg and Gutierrez continue to fight back in the Saubers? Furthermore, with Perez seemingly having saved his drive for 2014 with McLaren, can he build on this in Abu Dhabi? The last time Fernando Alonso finished a race outside of the points was Silverstone 2010. This will be a race we all remember for different reasons though (Ahem…Number 2 driver). Alonso finished the race in 14th position, but where did his teammate (Massa) finish? The question was: There was the possibility of the title being decided at the Japanese GP on Sunday. The last time this happened was in 2011, where Jenson Button raced to victory with Vettel claiming 3rd to become World Champion for the 2nd time. When was the last time, before 2011, the title was decided there? Answer: In 2003, Michael Schumacher was crowned World Champion in Japan. He finished 8th to secure his record-breaking 6th World Driver’s Championship, surpassing the record set by Juan Manuel Fangio in 1957. 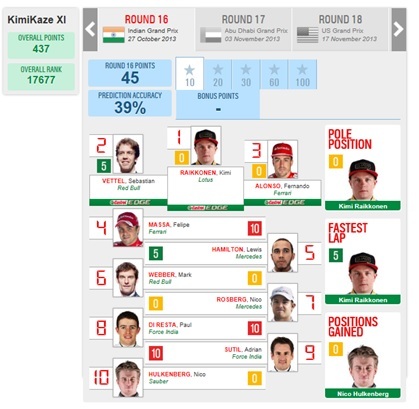 KimiKaze XI clearly has his F1 heart in 1 place only. Such that they don’t even have Grosjean in the points – when in fact he’s been a podium prize winner for 3 races in a row…. I happen to actually like the German Kid as a person and a racer. not gonna be duped into an argument over whomever is or was better – all tho I still think Jimmy Clark was the greatest ever 🙂 oops and haha. my bad! I have previously stated I firmly believe the greatest racers won in a multiple variety of racing venues of which we will likely never see again… but, 6 races in a row with a differing skill-set needed for each victory is pretty mega!! I know, with a car like that and a team like that makes things a whole bunch easier, but the driver still has to do his job excuisitly… job perfectly done IMHO! we all know he is gunning for 3 more poles, 3 more race wins, and 3 more race fastest laps this year. what more could one ask for??? Damn Webber (well, his alternator), I might have actually gained places had he actually finished in 2nd like he would likely have done.